Every time an advance is made in people actually respecting and accommodating others’ bodily autonomy, gender identity, disability, sexual orientation, or other difference, you are sure to hear the cry “it’s political correctness gone mad!”. A similar cry, of “Alphabet Soup!”, goes up whenever a new letter is added to the LGBT+ acronym. What you are hearing is the sound of the privileged complaining about a loss of privilege (otherwise known as ‘playing the game of life on a lower difficulty setting than other people‘, or ‘getting away with stuff that minority groups would not get away with’, e.g. Ryan Lochte, Brock Turner, and many other similar cases). Examples of advances in respect for others include the word cisgender being added to the Oxford English Dictionary, having gender-neutral toilets, labelling food for allergens, providing food for people with special requirements (halal, vegan, vegetarian, coeliac, etc), providing electricity for disabled people to recharge their wheelchairs, implementing consent policies at Pagan events… the list goes on. You name it, someone will probably have exclaimed “it’s political correctness gone mad!” (or something very similar) in response to every social advance that has ever been made, right back to that dangerously radical innovation of giving the vote to women, or perhaps even further back than that. Where does this insidious phrase come from? Its history is quite convoluted, but it has often been used as a pejorative term, and was fairly obscure (and a left-wing in-joke) until it was taken up by conservatives who were opposed to progressive educational policies. After George Bush Snr used it at a commencement ceremony at the University of Michigan in 1991, its use became widespread among conservatives to refer to anything they regarded as an “imposition of liberal orthodoxy”. It use rapidly spread to the UK, where it is used every time someone wants to do something inclusive and someone else perceives that their privilege will be eroded by being more inclusive. One example of privilege is that non-disabled Pagans don’t have to worry about wheelchair access to venues, and expect public Pagan events to be low-cost or free, so when event organisers book a venue, they are constrained by these expectations to look for lower-cost venues, which often don’t have wheelchair access. When it is suggested that all public Pagan events should be wheelchair-accessible, even if it costs more, you are sure to hear cries of “it’s political correctness gone mad” – despite the fact that accessibility is actually a legal requirement for public events. (Yet another reason to love Neil Gaiman.) He goes on to suggest that people should try replacing the phrase “politically correct” wherever we can with “treating other people with respect”. And now, thanks to a New Zealander called Byron Clark, there’s actually a Google Chrome extension that does exactly that. The latest version of “it’s political correctness gone mad” has emerged from some sections of polytheism: the accusation of “putting politics before gods”. It is particularly insidious because it implies that those of us who care about respecting the rights of our fellow humans (and of other animals) are somehow impious. 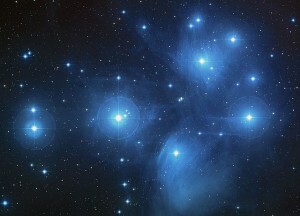 The central tenet of my religion is “only connect”: connect with other beings, respect their autonomy, honour their dreams and aspirations, and recognise the divinity within them. I believe that divinity is immanent in everything; every being has the seeds of godhood within them. Some choose to trample on the seed, others choose to nurture it towards growth – but divinity is everywhere, however dimly reflected. If I deny the divinity immanent in my fellow beings, then I am also denying the divinity of gods, who are expressions of the same divinity. Therefore, in my world, treating other people with respect is honouring the gods. The ancient stories of gods and angels visiting humans disguised as mortals are metaphors to express this idea. You never know whether the stranger to whom you showed hospitality and respect was a god in disguise – so you may as well behave as if everyone you meet is a god in disguise. Because actually, they are. What does your faith perspective teach you about refugees? How do your politics and your religious convictions come together to inform policy and shape your attitude? Every ancient pagan culture had very strong traditions of hospitality. These were often reinforced by telling stories of gods, goddesses, and angels disguised as mortals visiting people. The Greeks had a strong tradition of xenia care for the stranger. This carried its own obligations and traditions. When Nausica found Odysseus washed up on the shore, her care for him was very much in the tradition of xenia. 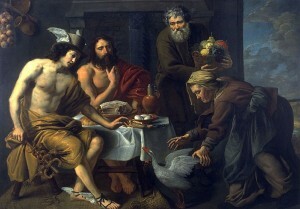 Mercury and Jupiter in the House of Philemon and Baucis, by Jacob van Oost (I) – Fine Arts Museums of San Francisco, Public Domain. The Hávamál, which means ‘the speech of the High One’ (Odinn) also contains stanzas about hospitality, and the duties of both host and guest. Ultimately, the two words, host and guest, are derived from the same Indo-European root word, and so imply that they were viewed as inseparable parts of the same relationship. I like to think of them as the two halves of a hinge. The relationship of guest and host is reciprocal, with sacred obligations on both sides. The concept and practice of hospitality are very important in India too, which suggests that the practice is very ancient indeed. Both Pakistan and Germany (and other places too) have the tradition of the guest-gift, where a guest will give you a gift the first time they visit your home. People from Latvia have a tradition of giving bead and salt as a gift when you have a new house. The sharing of bread and salt are considered sacred in many cultures. Once they have been shared, the relationship of guest and host is established and sacred. If we think back to the times when small villages were scattered among great forests, the arrival of a stranger with news from other places, new stories, new songs, and new jokes, maybe even new farming or weaving or metalworking techniques, must have been very welcome. There were also great movements of people in ancient times: Goths, Visigoths, Vandals, and Alans; settlers from the rest of Europe and North Africa who came with the Romans; Angles, Saxons, and Jutes who fled the rising waters of the North Sea and settled in Britain. More recently, there were silver miners from Germany who settled in the Mendips; many African and Middle Eastern people; the Huguenots fleeing persecution in France; Sephardic Jews from Amsterdam, Ashkenazi Jews from Eastern Europe, who began to arrive after the interdict against Jews was lifted in 1654 (it was put in place by King John in 1290 because he didn’t want to repay loans from Jewish bankers – who were forced to enter banking as other professions were closed to them). Everyone in Britain probably has a refugee or an economic migrant in their ancestry somewhere, if you go back far enough. Even Kate Middleton is related to a prominent Huguenot family. And both refugees and economic migrants have contributed hugely to the UK by creating jobs and boosting the economy with their spending power and tax contributions (and if they are not from the EU, they have “no recourse to public funds” stamped in their visa – so they receive no benefits and no free NHS). And in the US and Canada of course, unless you are 100% Native, you are an immigrant or descended from immigrants. I feel instinctively that openness to other cultures, and welcoming the stranger and the refugee, are good things. What kind of civilisation would we be if we were not open and hospitable? One that was both ethically and culturally impoverished, would be my answer. But I think that the gods and goddesses of Paganism – who frequently come to Earth to test the hospitality of mortals, and reward those who are hospitable, and punish those who are not – would agree that hospitality is a sacred practice and should be held in high honour. Of course, in the case of migration to other lands, there is the point of transition from guest to resident. Here again, we see the process of reciprocity at work. The migrant has paid their tax, contributed work and money to the system, and in many cases their food style and folk customs to the culture, and so after a time they become a member of the community. In societies that welcome immigrants, such as Canada, this is expected and encouraged; and education has been geared towards welcoming diversity for the last 25 years. More xenophobic countries (such as the UK) go to extraordinary lengths to prevent the transition from guest to resident. Both hospitality and reciprocity are Pagan virtues and have been since ancient times. Honour is also important in many Pagan traditions, and I think the honourable thing to do is to welcome the stranger. Hoarding wealth was frowned upon in ancient societies; wealth was displayed by the generosity of the ‘ring-giving lord’ who gave gold arm rings to his thegns, and the loaf-giver (hlaf-diga, the origin of the word lady). The social fabric was woven through the sacred practices of hospitality, fosterage, gift exchange, and reciprocity. We would do well to cultivate these virtues instead of xenophobia and suspicion. So I would definitely say that Pagan religions encourage us to show hospitality towards migrants and compassion for refugees.